Supported by our team of experienced engineers, we manufacture a qualitative range of flack ice handling systems. Our ice storage systems are designed using latest equipment including automatic ice rakes, screw conveyors and insulated enclosures. Our systems are known for sturdy construction, low power consumption and high performance. In addition, these systems are also fabricated as per the specific requirements of our clients. 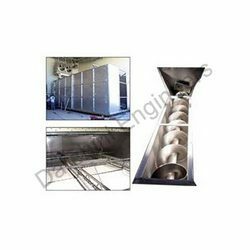 We are regarded in the market as a topnotch manufacturer, exporter and supplier of Flake Ice Handling System. The offered products are suitable for use of automatic storage bins, pneumatic conveying systems, screw conveyors and bucket elevators. Our products are highly praised for their compact designs and effective performance standards. We offer these products in a cost effective price range just for the ease of our clients.